who plans a public safety career. 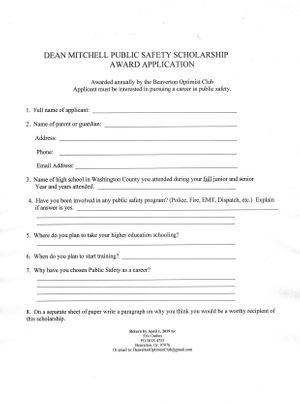 The late Dean Mitchell was a past president of the Beaverton Optimist Club. As a true optimist, he had a strong desire to help youth. This was especially true for those going into law enforcement. 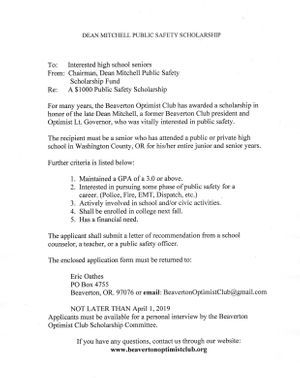 After Dean's death the club set up an annual scholarship for seniors in high school looking for a law enforcement career. Later the award was opened up to all public safety students: police, fire, EMT., dispatch. Download the document images below, complete the application, and return as indicated. Don't forget, the April 1, 2019 deadline. Cole Hoskins is our 2017/18 Dean Mitchell Public Safety Scholar. He attends Glencoe High School and plans to further his education at Linfield College. His goal is to become a firefighter. Cole grew up in a public safety home; both his parents work at the Beaverton Police Department. He is our first Fire Service recipient. He is an outstanding young man and our hopes and prayers are for his future service. 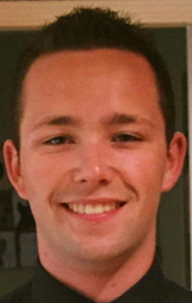 Kolton Alexander Fink, a graduating senior from Beaverton High School, is our 2016/17 recipient of the Dean Mitchell Public Safety Scholarship, which added $1000 to his college fund. He has been a Washington County Sheriff's Office Explorer since 2015. He is part of the Search and Rescue Team donating over 735 Search and Rescue hours and 400 law enforcement hours. He is a graduate of both the Explorer Training Academy and Explorer Law Enforcement Academy. Deputy Zackery Vance: "I have truly enjoyed supervising Kolton as he has a great attitude toward any task he is given, and looks for any way to improve his knowledge. Kolton has always been dependable, honest, and is very goal oriented. He is currently focused on achieving his goal to start a career in law enforcement." His whole family has been involved in public safety. His father worked in the Sheriff's Traffic Division. His mom is currently a training coordinator at WCCCA (Washington County Consolidated Communications Agency). One of his brothers is a Beaverton Cadet, and the other a Tigard Cadet. His younger sister plans on going into public safety. Gabriel Garrison was honored as the 2015 Beaverton Optimist Club Dean Mitchell Scholarship Recipient. 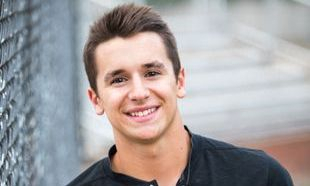 Gabriel is a 2016 graduate of Glencoe High School. 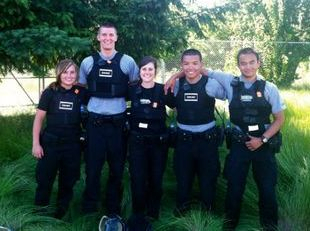 Gabe has served as a Police Cadet with the Hillsboro Police Department where he has remained very active. He plans to attend Western Oregon University, and then on to police academy to become a police officer. Gabriel's baseball coach says he was co-captain of the high school baseball varsity team, informed, speaks his mind when appropriate, has maintained a high GPA. In short he is a real servant-leader. Thursday, July 21, 2016, 7:00 - 8:00 AM was the recognition breakfast. In the crowd was Gabriel and his girlfriend; the Chief of the Hillsboro Police, the Washington County Sheriff, and other representatives from the Sheriff's Office, Beaverton PD, and Hillsboro PD. We were honored to have Dean Mitchell's daughter, Melissa, her husband, and Dean's nephew, Bob. Bob entertained us with his piano accordian and singing of the unofficial Beaverton Optimist Song. Brittany Chandler is the Beaverton Optimist Dean Mitchell Scholarship recipient for 2014. She graduated from Sunset High School in June, 2014. 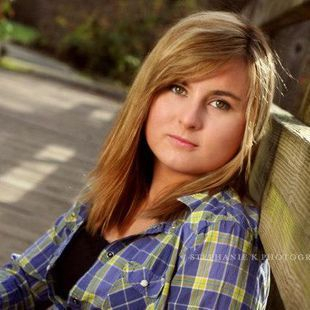 Since June of 2011, Brittany has volunteered as an Explorer for the Washington County Search and Rescue Team, Post #877. Our 2013 scholarship winner is Ashley Nicole Eddy from Aloha High School. Ashley served on the Washington County Sheriff's Office Search and Rescue Team for two years, was involved in numerous ride alongs. She is on the 2013 Law Enforcement Challenge Team for the Sheriff's Office and will be competing in August. She will be attending Pacific University.